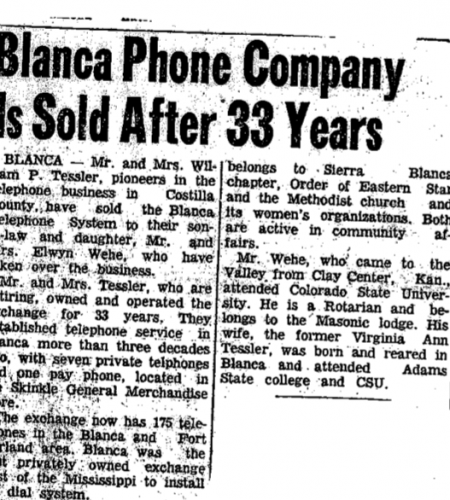 In 1926, local businessman and politician William Tessler founded what is now known as Blanca Networks. 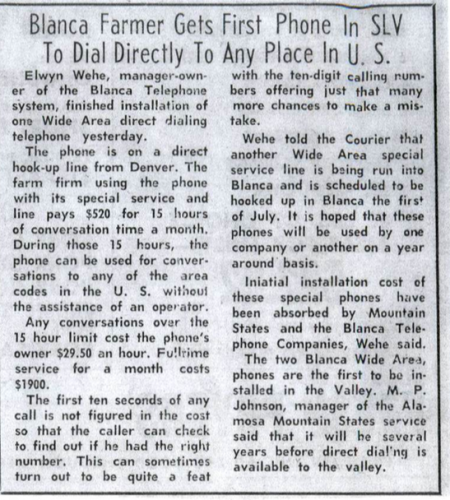 Originally coined the Blanca Telephone System, we were the first local telephone company established in the San Luis Valley, serving a total of four subscribers. 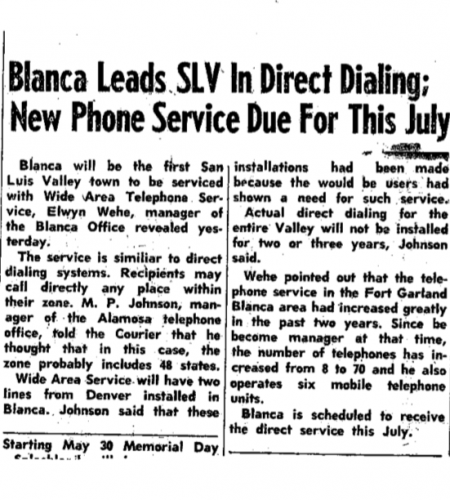 In 1947, Blanca Telephone Company was the first company west of the Mississippi to install an automatic switch, offering 4 toll links to Alamosa, Colorado, communication to the outside world. 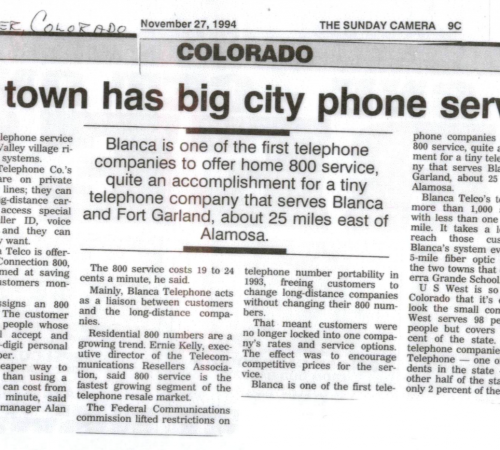 A few years later, we erected our first tower in Blanca, Colorado and established our storefront in Blanca, Colorado. Between 1960 and the 1990s under the leadership of Al & Virginia Wehe, exciting developments took place in the telecommunications industry. Ahead of the curve, we expanded our service network to Deer Valley Meadows, Forbes Park/Wagon Creek, San Luis Valley Ranch, and Forbes Park. 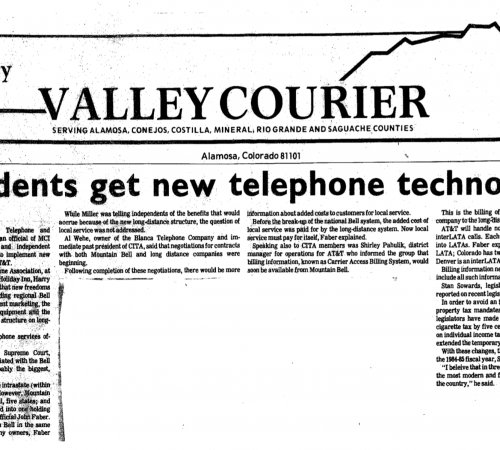 In 1971, we moved our business front from Blanca to Alamosa with the intention of expanding our network and improving our business operations. And, in 1996, we began offering internet to the residents of Northern Costilla County and Eastern Alamosa County. In the 2000s, Alan Wehe, son of Al, became general manager of BTC. With the new millennium came rapid development of communications technologies, including the creation of high-speed Internet, delivered over the digital subscriber line (DSL). Additionally, Blanca Telephone Company invested in building a fiber-optic network to meet growing broadband demand, including fiber-to-the-home in Blanca, Ft. Garland, and Forbes Park. In recent history, we installed three backup data routes – two fiber and one microwave – out of the San Luis Valley, ensuring that our customers are always connected. Rebranded to Blanca Networks in 2018, Blanca Networks is the only Gig-Certified Capable Provider in southern Colorado and we now offer 1 Gig internet service to local businesses and residents in select areas, a service package rarely available in rural areas. Staying ahead of the industry, we are constantly upgrading our local systems to improve the way our customers connect.